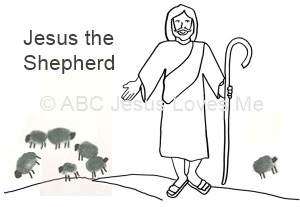 - Color the Jesus on the Jesus the Shepherd worksheet. Using a black ink pad, stamp thumbprint lambs on the worksheet. Add a head, legs and a tail to the lambs. Add the title "My Shepherd is Always with Me." - Add a few drops of black and brown paint on the Triangle and Circle worksheet. Drag a string through the paint to spread. 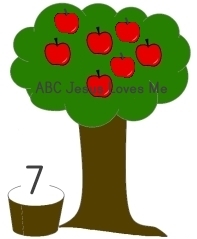 This week paste torn pieces of tissue paper on the Apple Tree Number #7 worksheet. Add seven apple stickers. Continue to count items throughout the day. - Although you will still need to supervise the child brushing his/her teeth, allow the child to start the process. Help put the toothpaste on the brush and encourage the child to "make bubbles" while brushing their teeth. Work up to brushing for 2 minutes or while singing the "ABC's" song twice. Talk about brushing the front, back, top, and bottom softly. - Place the Brush Your Teeth worksheet in a ziptop bag or plastic cover. 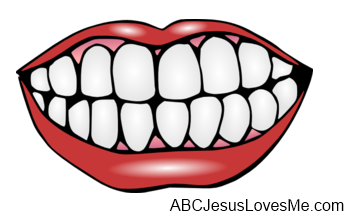 Color the teeth with a black dry erase maker. Using an old tooth brush, allow the child to brush the black away. - View and print a Story Pattern by Kizclub.com to help with the sequence. Glue flannel material on the back and create a wonderful flannelgraph story. - Click to read the ABCJLM version of "Going on a Bear Hunt." Put together peg puzzles. Encourage your child to pick up the puzzle piece using her thumb and index finger.